This 3 hour Mimi tour is for people that don’t want to waste precious vacation hours on tour buses picking up and dropping off hordes of people or waiting in long lines at the Dam, and just want to visit and experience the Dam without wasting a whole day and get back to the strip. It is Also for people that have a late afternoon flight and have nothing to do to fill the time after your hotel kicks you out. That’s why we developed this mini tour... after the tour we take you back to your hotel where you will still have the rest of the day to do whatever you like or drop you off anywhere on the strip.This is a small group tour, to be time sensitive, and most important to offer you a more personal experience. quick Stop at “Welcome to Las Vegas Sign” for pictures. No waiting in line. Drive to Hoover Dam approx 30-45 minute drive. Hoover Dam bypass Bridge (Mike O’Callagham-Pat Tillmam Bridge) where we will park and walk up to the bridge and enjoy an incredible birds eye view of the Dam and Colorado River. stop at Lake Mead Lookout for an amazing panoramic view of Lake Mead and a photo op. 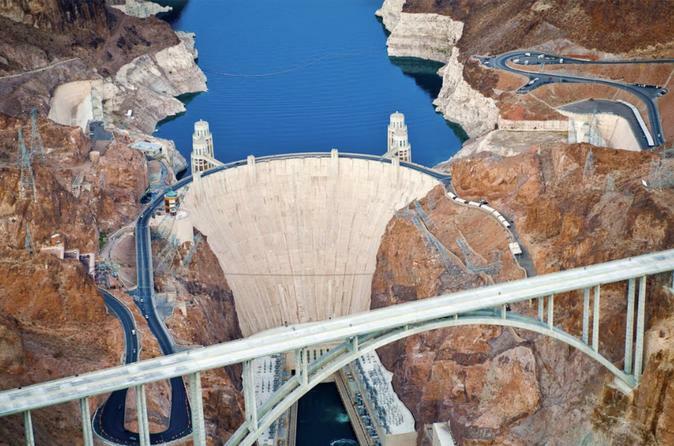 Drive across Hoover Dam and go to various lookout points to view Dam and take pictures. Drive back to hotel or strip for drop-off.